Cook 500g bag Waitrose Baby New Potatoes in boiling water for 15-20 minutes until tender – drain. Meanwhile, heat 1 tbsp oil in a large frying pan and fry an essential Waitrose Onion, chopped, for 4-5 minutes. Add 195g can essential Waitrose Sweetcorn, drained, and cook for 1 minute. Stir in 1 tsp dried mixed herbs, 140g pack essential Waitrose Corned Beef slices, broken up, and 2 tbsp sweet chilli sauce. 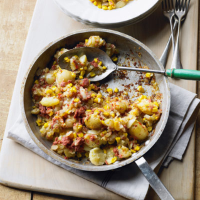 Coarsely mash the potatoes, mix into the corned beef mixture and cook for 1-2 minutes. Season to taste.